More than 2/3 of Americans do not eat the recommended five servings of fruits and vegetables daily? More than 90% of American adults fail to get the three to five recommended daily servings of whole grains? More than 80% of Americans do not eat the recommended three weekly servings of fish? We are under enormous stress from work, personal issues and global events? More than 70 million people have reported that they have less than optimal digestion? All of these factors impede the ability of our cells to receive optimum nutrition. If we want optimum health we need to focus on getting the right balance of nutrients delivered to our cells. This is achieved through what we call the Nutrient Superhighway, that helps keep our bodies functioning optimally by ensuring that the nutrients from our food, and the dietary supplements we consume, are delivered to every cell and tissue in our body, while also removing the waste products our bodies normally generate. 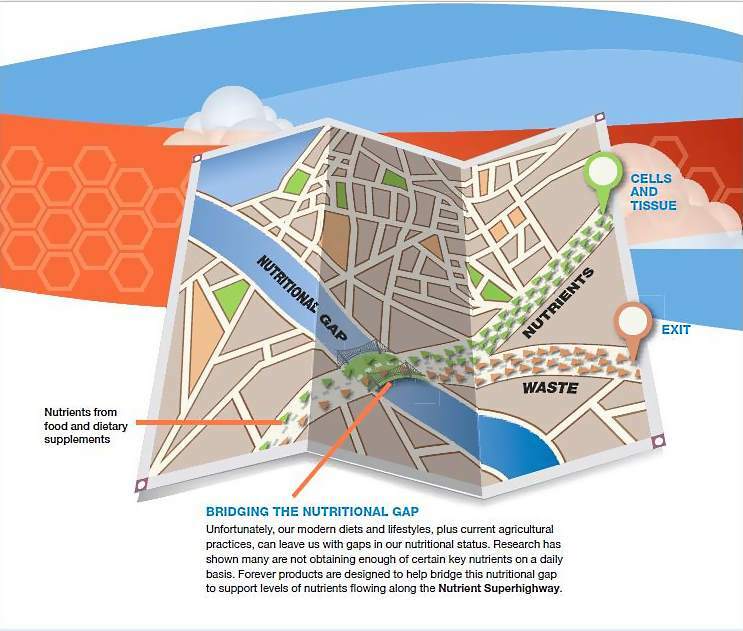 What supports the Nutrient Superhighway? This seems simple enough, but few of us succeed in achieving this goal. All of these factors impede the ability of our cells to receive optimum nutrition. If we want optimum health we need to focus on getting the right balance of nutrients delivered to our cells. Unfortunately, our modern diets and lifestyles, plus current agricultural practices, can leave us with gaps in our nutritional status. Research has shown many are not obtaining enough of certain key nutrients on a daily basis. Forever products are designed to help bridge this nutritional gap to support levels of nutrients flowing along the Nutrient Superhighway. 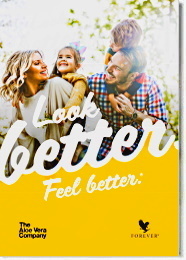 Forever Daily provides essential vitamins and minerals and helps to ensure we are obtaining the levels of these nutrients we need for optimal health and, to fill in the gaps where our diets may be lacking. These nutrients are then carried along the Nutrient Superhighway to our cells and tissues to support optimal functionality. Forever Arctic Sea provides a balance of the essential fatty acids that are missing in our modern diets. Omega 3 fatty acids from cold water fish help correct imbalance in our diets and bring us closer to the ideal 1:1 ratio of Omega 3 to Omega 6 fatty acids that help to support the cardiovascular system and digestive tract, both essential components of the Nutrient Superhighway. 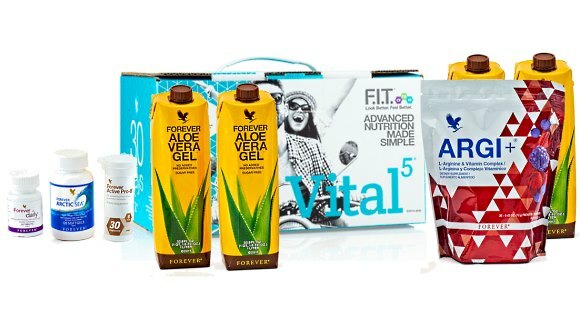 Forever Aloe Vera Gel supports the digestive tract, one of the primary components of the Nutrient Superhighway, where our food and nutrients are absorbed. 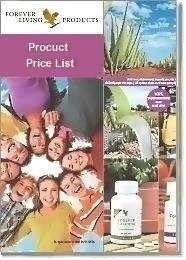 Aloe can help to support nutrient absorption, bioavailability and waste elimination. ARGI+ provides arginine plus supportive nutrients for nitric oxide production in our bodies. Nitric oxide supports the circulatory system, which carries nutrients through our bodies to the cells and tissues. It also carries waste products from normal metabolic processes to be eliminated by the body. Forever Active Probiotic supports the proper balance of good and bad bacteria in our bodies, to support digestion and the absorption of nutrients onto the Nutrient Superhighway. Together these products, that form a powerful nutrition superhighway that serves as the building blocks of any customized nutritional program, provide important, vital nutrition to help the body’s systems operate at their peak. Giving your body the things it needs doesn’t have to be difficult – Vital5 is advanced nutrition made simple to help you look and feel your very best.